We often hear about the horrors of puppy mills in the media, through animal welfare and advocacy groups, and from fellow dog lovers. What actually defines a puppy mill? Why are puppy mills a problem? 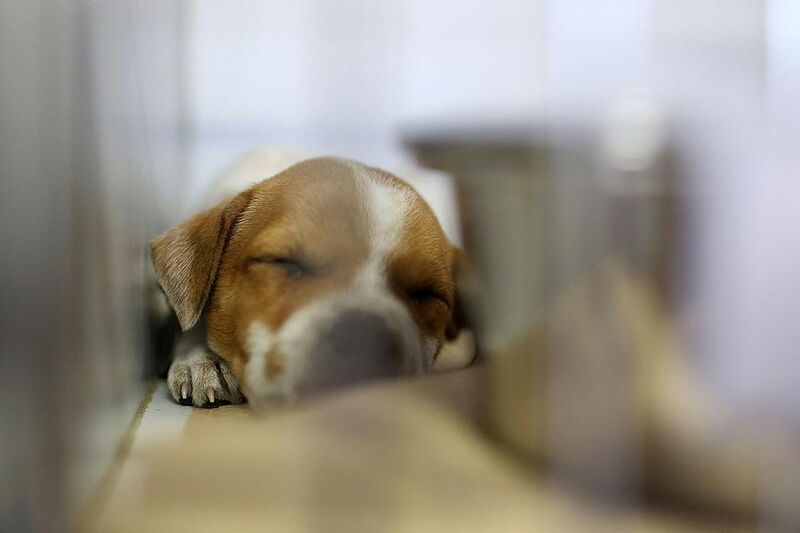 What can we do about puppy mills? The term puppy mill is used to describe a large-scale commercial dog breeding enterprise. Sometimes called puppy farms, these operations tend to house their dogs and puppies in squalid conditions and focus on profit over the health and well-being of the animals. Puppy mills do not actually refer to their businesses as such; they usually simply call themselves dog breeders or kennels. Puppy mill proprietors mass-produce puppies by over-breeding dogs, often regardless of health or genetic defects. The breeding dogs spend their lives being bred repeatedly until no longer deemed useful, then destroyed. The animals are kept in cramped, unsanitary prisons (usually very small wire cages) with little or no chance to play, exercise or become socialized with humans and other dogs. By six to eight weeks of age, most puppies will be sold to pet stores or marketed directly online. Sadly, a large percentage of puppy mill dogs will develop health and/or behavior issues. Many are eventually abandoned or euthanized because of these problems. On the surface, it may be difficult to discern between a puppy mill and a responsible breeder. Go beyond the surface, though, and the difference is quite obvious. Responsible breeders put the well-being of their dogs first and strive to improve their breed. They work closely with veterinarians and other pet professionals to ensure the health and safety of their dogs. Responsible dog breeders have their dogs screened for specific health problems (e.g., orthopedic, heart, eyes) and are up-front and honest about the puppies' medical histories and genetic lines. Dogs with health issues or behavior problems are not bred, especially if their issues are potentially hereditary. Instead, they are spayed or neutered and placed in good homes. Responsible breeders are affiliated with their local and national breed clubs and should be able to provide plenty of excellent references. They tend to operate on a smaller scale than puppy mills. In many cases, they make little to no profit. Puppies coming from these breeders are usually raised in home-like environments and are socialized from birth. The dogs used for breeding often spend their lives as family pets. Finally, any responsible dog breeder is willing and eager to take back a puppy or dog from its new owner if a hereditary issue appears or if, for some reason, that owner can no longer keep the dog. In the case of puppies that come from puppy mills, it may be impossible to trace back the origin of that puppy. The simplest reason why puppy mills still operate comes down to supply and demand. Certain dog breeds or hybrid dogs (Goldendoodles, Puggles, etc.) are extremely popular, sometimes to the extent that there are waiting lists for the puppies. Uninformed prospective dog owners may be lured by adorable photos and attractive websites set up by puppy mills. Finding that there are puppies available for purchase, people might jump at the chance to get one of their own. In some cases, people are not willing or able to pay top dollar for the dogs they want, so they find a lower price and don't realize it's a red flag. Puppy mills may sell their dogs for slightly less than their quality counterparts in order to attract buyers. Unfortunately, after looking for a "better price" or a more readily available puppy, many people unknowingly buy dogs from puppy mills. Sometimes it is because they were fooled by cute pictures on a flashy website or a very convincing argument from the pet store. The old saying "if it sounds too good to be true, then it probably is" really applies here. Play it safe and get your dog the responsible way: through an experienced and reputable dog breeder. Also, remember that there are plenty of purebred dogs and cute mixes in shelters and rescue groups. Never purchase a dog or puppy from a pet store (this does not include in-store pet adoptions that are run by legitimate pet rescue groups). Adopt your dog from a local animal shelter or rescue group. If you have your heart set on a particular breed, check out breed-specific rescue groups in your area. Always visit the facility and talk to the dogs' caregivers. Find out as much as you can about the dog's history. If choosing to buy a purebred puppy from a breeder, obtain plenty of references and follow up on them. Research the breeder through the national and local breed clubs. Visit the home or kennel where the dogs live. Be sure to meet the mother dog (and father too, if possible). Never purchase or adopt a dog from an online kennel/breeder without first visiting the facility. You should not need to buy a dog from such a distance that it would have to be shipped to you. If you suspect you have found a puppy mill or otherwise inhumane dog breeding operation, contact your local authorities immediately (police, SPCA, Humane Society). It's common to hear people ask this question: "By purchasing from a puppy mill or pet store, wouldn't I just be rescuing that poor puppy from a horrible life?" The answer is a firm no. This is a very common argument that might seem logical at first but is actually a very bad idea. Purchasing a puppy mill dog is only helping to keep puppy mills in business. Why should a cruel, inhumane organization make a profit? If you truly want to do the right thing, report the puppy mill to the authorities so an investigation can be conducted. Allow the dogs to be taken in by animal care professionals and have full veterinary evaluations. If and when they are put up for adoption, you can even adopt one of the puppies. This way, the animals get the care they need and the homes they deserve, while the puppy mill goes out of business and the unethical proprietors are prosecuted accordingly.